High Quality Content by WIKIPEDIA articles! 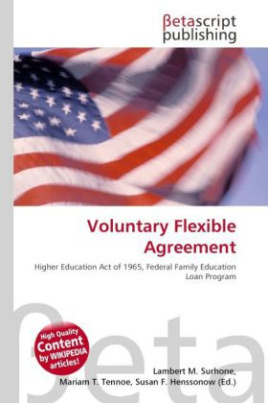 The Voluntary Flexible Agreement (VFA) was created by the United States Congress in 1998 during a reauthorization of the Higher Education Act of 1965. The VFA enables Federal Family Education Loan Program (FFELP) guarantors to develop programs and techniques to help borrowers avoid student-loan default and all of its negative consequences. The VFA objective is experimentation for the purpose of finding the best practices, collecting long-term data, and sharing results in order to determine what benefits schools, students, the federal government, and the American taxpayer.